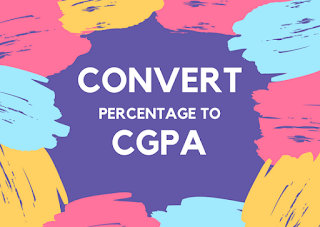 How to calculate CGPA from percentage ? How to calculate CGPA from percentage ? : Every year CBSE conducts annual examination for Class 10th and Class 12th students and lakhs of students appear for their examination. I’m not ranting CBSE but their syllabus is not updated since last 10 or more than 10 years. We need the change because technology is progressed and that 10 year old syllabus is of no need in today’s world. Well that’s not the topic. But I request our government to update and enhance educational system. So now Let’s come to our topic that is how to calculate CGPA from percentage. Calculate your overall percentage by calculating the mean of your scores of every subject. For e.g. if you have 5 subjects and you’ve scored 90/100 in English, 86/100 in Math, 45/50 in Drawing, 96/100 in Science and 43/50 in Hindi. Then just calculate your overall percentage. In this case the approx percentage scored is 90%. You can calculate the percentage by using this Formula = Marks Obtained/Total Marks x 100. Then to calculate your CGPA you need to divide this percentage by 9.5. Yes, this will give you your actual CGPA scored. In this case, 90/9.5 is 9.4. So our scored CGPA is 9.4.
angles. Again, thanks for the post!